Jennifer Rooks Wenker will be honored at a meet-the-artist reception Thursday, Oct. 21, at Southern State Community College’s South Campus near Fincastle in Brown County. Her pastel landscapes are currently on exhibit at SSCC’s South Campus. “Landscapes/Meditations on Color,” an exhibition featuring artist Jennifer Wenker, is currently on display in the Learning Resources Center (LRC) of Southern State Community College’s South Campus, 12681 U.S. Route 62, Fincastle. The exhibition will be available for viewing through Dec. 10. A meet-the-artist reception will be held 6:30-8:30 p.m. Thursday, Oct. 21, in the LRC. A Greenfield native, Wenker earned her bachelor’s degree in studio art from Morehead State University and is currently working toward an M.F.A. from the University of Cincinnati. 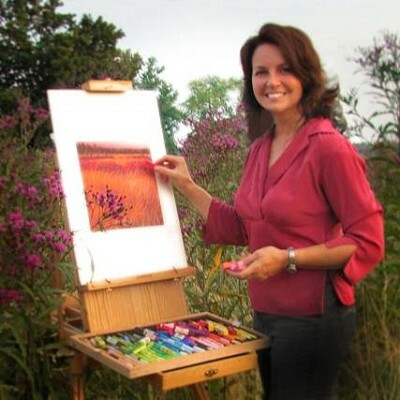 She maintains a web site at www.jenniferwenker.com and works from her home studio which overlooks the natural landscape of rural Ohio. “Fields of grasses are deeply spiritual places for me,” she said. “They are metaphors for the unique expressions of the spirit: Many individuals sharing root systems, sharing the elements of the soil and the water to grow; they are individuals bending together in the winds, holding fast to the earth. Their gentle music is meditative and renewing. I feel connected there and I find peace. “The focus of my new work is on color relationships and patterns of light and shadow in the tall grass fields of the Appalachian foothills—my home. My goal is to paint the emotional feeling of a place—not to describe colors in a photographic way. Wenker and her husband Randall, a psychologist with the Veterans Administration Hospital in Chillicothe, have two daughters, Hannah and Hope. The family owns and operates Spring Hill Farm, an organic dairy near New Petersburg in Highland County. For more information about exhibition hours, please contact Mary Ayres, LRC manager, at 1-800-628-0307, ext. 3680, or mayres@sscc.edu.